BANGI, 3 July 2014 – Nearly half (49%) of all medical students of The National University of Malaysia (UKM) at its Cheras campus in Kuala Lumpur suffered from stress. A study carried out this year by a team of fourth year medical students of the university found that stress was highest among the first year students at 50%. However they found that stress level among the third year students was below the average at 48%. 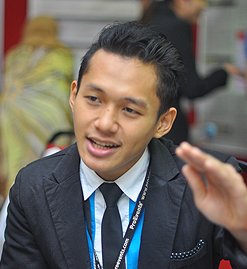 Team leader Amir Abdul Rahman told the UKM News Portal at the Medical Undergraduates Annual Scientific Research Meeting (MUASRM) 2014 held recently in Kuala Lumpur that he and his colleagues sampled 234 medical students of whom only three did not respond. Fellow researchers Norsyafiqah Abdullah and Chu Pei Shan who analysed the data noted that there was a significant association between study-year and stress. They also observed significant association between ethnicity and stress in the third year. The respondents said the most commonly used method to cope with stress was to study harder and do well in exams. The survey also found that the Malays with 63% suffered the highest rate of stress followed by Chinese with 28% and Indians 9%. Amir said the research was prompted by an incident involving a third-year student two months earlier took his own life due to some stress-related problems. They wanted to know whether the condition could be detected early and mitigating action such as counselling and peer influence could then be initiated. For first year students, the study found that many respondents admitted that they did not like the course that they had signed for but were unwilling to transfer to another faculty because of family pressures and a commitment not to let their parents down. However, some students did change courses and were happy with their decision. The overall outcome of the study was that stress among the students was higher than expected. Most of the respondents tried to overcome their stress by immersing themselves in their studies. The researchers recommend the university initiate some form of stress management exercise to stave off any undesirable consequences. They admitted that tertiary education was always related to highly stressful events, especially for medical students who face a very demanding course. They were also concerned that half of all medical students at UKM had stress-related problems, something which they had not anticipated.